This is another end times sign. When Jesus was asked by His disciples what it would it be like at His second coming, Jesus said it would be like the days of Lot. This is just one of the signs; a great falling away in His church (apostasy) would be another. Church denomination after another has capitulated with gay marriage and homosexual leaders in the church. Where does your church stand on the inerrancy of Scripture? 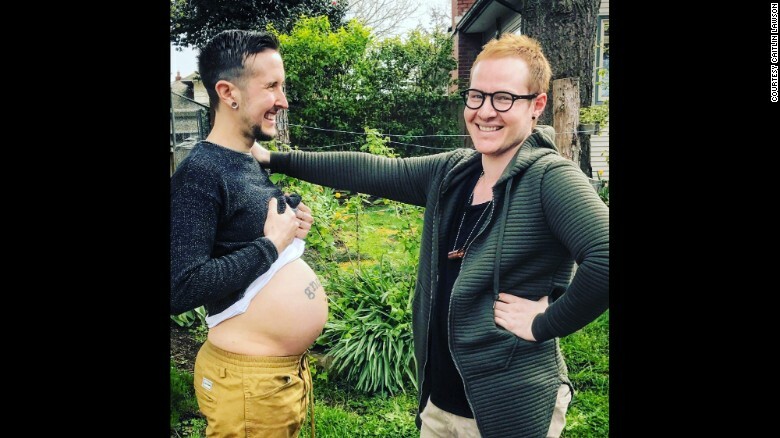 Trystan Reese is a trans man who is expecting a baby with his partner of seven years, Biff Chaplow. Reese, who was assigned the female gender at birth and says he kept his “original parts,” adds that he never wanted to change his body. “I think my body is awesome. I feel like it’s a gift to have been born with the body that I did, and I made the necessary changes so that I could keep living in it, both through hormones and through other body modifications,” he shared in a video posted to the couple’s Facebook page. Reece is a female with all the right parts to have a child, moreover he thinks his body is awesome so why he would choose to take male hormones to take on the appearance of a male? It is odd, and from a Christian perspective not honouring to the God who made her and very confusing to the children they raise. In true gender-bending fashion, “easy breezy beautiful” CoverGirl is now playing up its first “CoverBoy” model. Completely with eyebrows thicker than Brooke Shield’s hallmark, freckles across the nose and upper cheeks, bright red lips, lots of mascara and a baseball cap, the YouTube sensation is ready to cash in on his femininity. James Charles, a 17-year-old high school student, is the first poster boy for the female cosmetics line. For 60 years, the company has catered to teens and women but apparently sees a new market as transgenderism rises in America and beyond. Almost Everything the Media Tell You About Sexual Orientation and Gender Identity Is Wrong. A major new report, published today in the journal The New Atlantis, challenges the leading narratives that the media has pushed regarding sexual orientation and gender identity. When it comes to the authors of this important new study, they are hardly right-wing, fundamentalist, conservatives. Hardly! Dr. McHugh “was elected a member of the National Academy of Medicine (formerly the Institute of Medicine) in 1992. From 2002 to 2009, he was a member of the President’s Council on Bioethics,” among his many accomplishments. I can assure you, though, that rather than interacting with the scientific evidence presented in this formidable study, the vast majority of LGBT activists and their allies will dismiss it out of hand. Why? Because, they will say, Dr. McHugh is an infamous transphobe who is totally out of touch with modern science while Dr. Mayer is unqualified to write on this topic. LGBT activists dismiss the most important consideration, we are made by God in His image. He is a loving God as shown by Jesus life, death and resurrection. God will answer the prayers of the parents who are concerned about the gender of their children and He will answer the prayers of the children.